Stay Your Way at Our Buffalo, NY Airport Hotel Home to the Buffalo Bills, Niagara Falls, and Buffalo Wings, Buffalo is a city that continuously surprises visitors with its cultural and cosmopolitan atmosphere and offers plenty of opportunities to have fun and relax.If you plan on enjoying everything to see and do in the Buffalo area, our hotel's location is ideal. 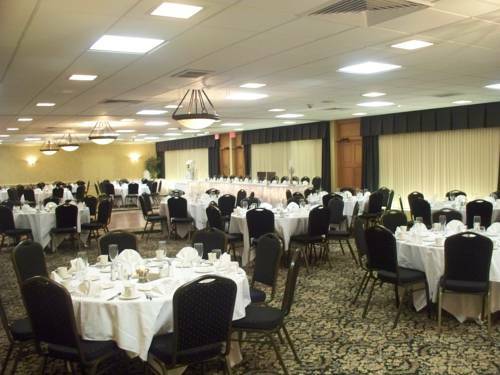 Eight miles from downtown and only a quarter-mile from the Buffalo - Niagara, NY Airport, our hotel is near attractions like First Niagara Center, Ralph Wilson Stadium, the Buffalo Zoo, and ice skating at Holiday Twin Rinks. You can enjoy great shopping at the Walden Galleria Mall and downtown boutiques, as well as many great dining options. And if you want to see the mighty rush of Niagara Falls, our Buffalo area hotel's only 22 miles away.The Holiday Inn is one of the best Cheektowaga, NY hotels near the Buffalo Airport, and we offer free 24-hour shuttle service so you can always make it to your flight on time. We're near businesses like Calspan, Sonwil Business Park, DRS Tech, E & E, and Siemens, as well as the Lancaster Business District, and we have a business center, and meeting space for your use.Make your plans today to enjoy the outdoor pool, indoor whirlpool, 24-hour fitness center and Max's Classic American Grill! Denny's: Fast, inexpensive family food served 24 hours a day. Salvatore's Italian Gardens: Spectacular dining rooms offering Italian American cuisine. Canadian BorderIf crossing into Canada, please make sure you have a passport or enhanced drivers license. Ralph Wilson StadiumHome of the Buffalo Bills.